It would be better if Mint would prompt users to reboot their computer when Update Manager finished updating kernel. At the present, Mint does not do it, though Ubuntu does it. When Update Manager finished updating kernel, Notification will pop up, and mintMenu Icon's background will turn to be red. Then users click on mintMenu Icon, [Quit] Button has already turned to be red too. 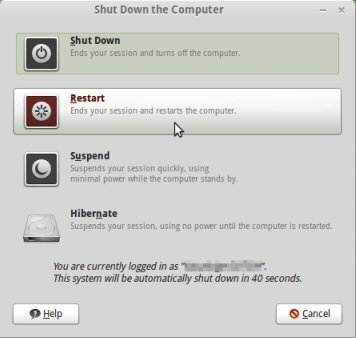 And then users click on [Quit] Button, [Shut Down the Computer] Dialog will appear, [Restart] Button has already turned to be red too. 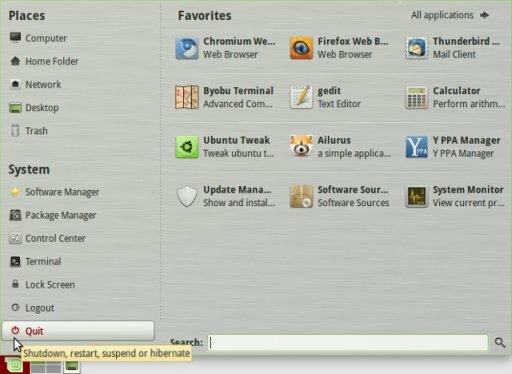 I think it is helpful for users, especially Linux Newbies. FinixFighter	 This would be useful! kazztan0325	 Sorry for my delayed reply. Thank you @RayWoods for putting this forward! RayWoods	 Although it is unusual to update the kernel during the life of an edition it is not unknown (with level 1, 2 or 3 updates); it would be a good idea to prod users on the odd occurrence when a reboot is necessary. I don't understand someone is against this idea. I would be able to understand if Mint Team is against this idea with the reason which would satisfy us. Do you want to say "Mint users should not update kernel, if they want to let their Mint be stable."? Then, Why does mintUpdate have options to allow users can install packages which their Level belong to  and ?, though they are not visible by default. It is certain that updating kernel could be attended by risks. But it is also certain that newer kernel has some bug fixes and some improvements in function. And it is also certain that there are some (or many?) users who want to try to install updated kernel, though they know it could be attended by risks. 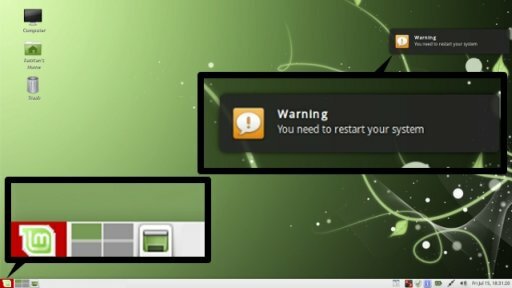 Then, What is wrong with Mint would prompt users to restart system when updated kernel? remoulder	 This idea is irrelevant in general since Mint is designed to be a stable distro and as such does not encourage kernel updates, this is why the mintupdate levels are as they are. Also as already mentioned, there is existing software that caters for this for those users who wish to do so. Jac978	 I agree with this idea. When I updated kernel lately, I carelessly almost forget to reboot system, though I manually selected kernel modules to install. Am I suffering from senile dementia? ?..., though I am not an old man. Yes, 'indicator-applet-complete' and 'indicator-applet-session' have this feature, but Mint doesn't have it on panel by default. So it would be nice if this idea would be implemented. Thank you for your second comments. Yes, I also worry that it could be too much work for Mint Team to implement. And "there are also some problems because some parts must be done upstream (gnome)!" as you said. But I am glad if at least 'Notification by notify-osd' and 'mintMenu Icon's background turn to be red' this two functions would be implemented. blueXrider	 I think it is a good Idea. I recently did a update && upgrade using apt-get but wasn't prompted to restart. I knew I was updating the kernel to 2.6.38-10 so I had to restart. Would be nice for the prompt. mikefreeman	 I always install indicator-applet-complete, because I actually like the me-menu. I allow my kids to use my computer for things, and I've given them their own accounts with restricted permissions settings, so it's nice to be able to see at a glance which account they are logged into at any given moment. Anyway, indicator-applet-complete has this feature, and it's really nice. It not only works for kernel updates, but any low-level update that doesn't get restarted on a simple log-out/log-in. But I like your implementation of it even better! DJCrashdummy	 for sure, you are able to update the kernel of LinuxMint within mint-update, synaptic or also apt-get! - apologize... i forgot to say if newbies use mint-update with DEFAULT-preferences the kernel never will be updated! so... if you update the kernel "manually" you should know what are you doing and this includes at least the reboot after a kernel-update!!! well... but like said before: i like this idea (if it's not too much work to implement)! - maybe there are also some problems because some parts must be done upstream (gnome)! but at the end this is up to clem and the developers...! DJCrashdummy	 yes this is a nice idea! - i especially like the red light indicator very much!!! BUT if you (or newbies) only use mint-update for your updates the kernel never would be updated because it is rated to be in group 5! Sorry, I am also not sure how many times does the kernel get updating from when a Version be released to when it reaches end of life. But there are many users of Mint 9 Isadora (LTS) and Mint 10 Julia. And the number of Mint 11 Katya users has been increasing. By way of parenthesis, Katya had updating kernel once lately. psyckers	 The idea is cool especially the red light indicator. I am just not sure how many time the Kernal gets updated for Mint between Mint distros.